Apply the CP of the step #10. 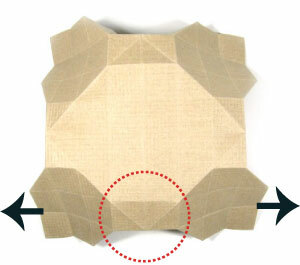 Prepare to streatch the two edges following the arrow directions. Then let us concentrate on the region encircled with a dotted circle. Streatch the two edges following the arrow directions of the step #11. 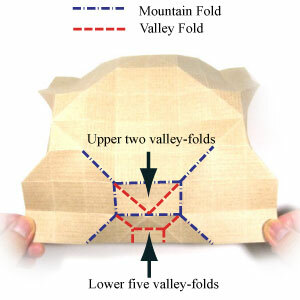 Prepare to apply the upper two valley-folds. The lower five valley-folds will be automatically applied if you just follow me.